Funny Sign – Watch Out! Look closely at this sign, see if you notice anything strange or out of the ordinary. There, you see it? Yes, that’s a T-rex on the sign, which is apparently yet another traffic hazard here in the Western US along with traffic cones and rattlesnakes. I have yet to spot one in my travels, I hear they are shy, and tend to only come out to feed. Some say they are more afraid of us than we are of them, although with the size difference it’s hard to say. I’d personally avoid them, too many teeth and man eating tendencies for me. 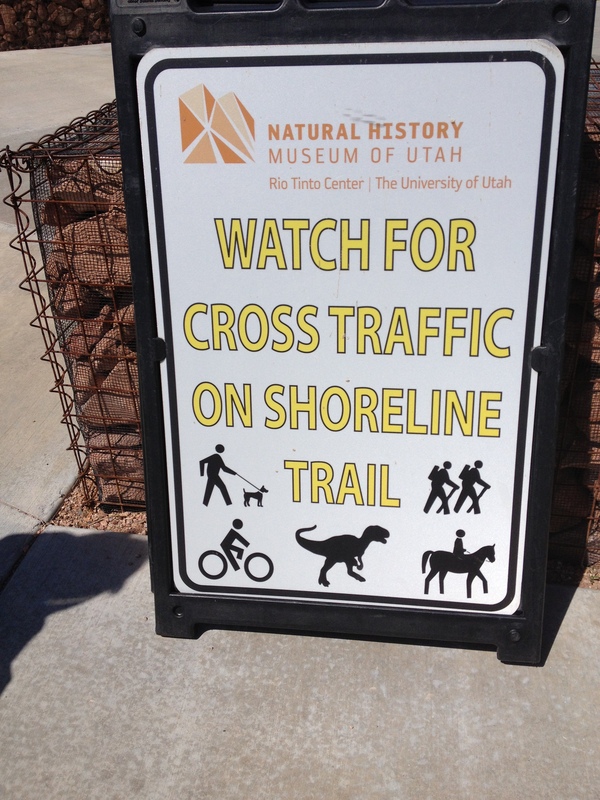 I found this sign outside of the new Natural History Museum of Utah, nestled up in the foothills of the Wasatch range of the Rocky Mountains. The museum is located right next to the Bonneville Shoreline trail, which contrary to its name doesn’t actually run along a body of water, but refers to the ancient and long gone Lake Bonneville which used to cover a good part of the state of Utah. Instead, the trail offers terrific views of the valley floor and is a favorite among trail walkers and bikers alike. The museum itself is a must see with huge dynamic exhibits that cover the full spectrum of life on earth from the dinosaurs all the way up to modern biology. My kids love the hands on exhibits and the onsite paleontology lab where they can watch real scientists work on real dinosaur bones. I love the ease and accessibility of the different exhibits and how they flow from one to the next, bringing the visitor from the darkest recesses of prehistory all the way to the present day. That, and the dinosaur exhibit is pretty awesome. If you plan on coming, prepare to spend several hours – there’s plenty to see and do for everyone. Just watch out for those pesky T- Rexes, they tend to take a bite out of your day!